Today We Publishing Islami Bank Bangladesh Limited ibbl Job Circular 2018. It has been taking by the Bank Authority Website. 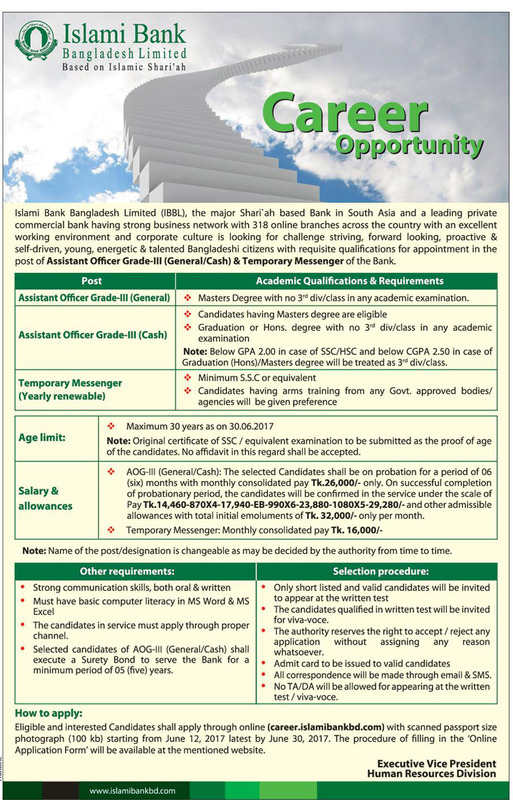 Thay are uploaded This ibbl Bank Job Circular 2018 on www.islamibankbd.com. This Online Bangladeshi Famous Bank job circular Last line is 30th June, 2018. In the Job Circular 2018 Vacancy post of Application Developer Officer, IT Security Officer, Application Server Management and Documentation Engineer Officer And Assistant Officer Grade II In IT Support Service Sector. Ibbl Recruitment called for Total 10 ten categories. Before This Job, Circular 2018 has been published The Daily Star on 13th April 2018. Why Should You Appy ibbl officer job 2018? Because Islami Bank Bangladesh Ltd is one of the most Famous and online banks in Bangladesh. Islami Bank Bangladesh Online Limited is the major Shari’ah based bank in Our Country. Also, This is the largest private commercial bank in Asia. Every year Most of the Educated Job seeker join in Many levels of The IBBL Bank. In a talk, Do the job in Rank or Bank. So you should Apply to Bank job circular 2018 within the deadline. we Specifically referred career Islami Bank bd job detail. so you can know all information about Islami Bank Bangladesh Admit Card, Exam Date, Qualification and More. Eligible Candidate Do not late to see bellow. Job Type: Bank job circular 2018. Published Date: 07 June 2018. Application Last Date: 30 June 2018. Salary: See The Job Vacancy. How to Apply To The Job: Follow The Original Jobs Notice. For Reader Concert, We Did Convert Islami Bank Bangladesh Limited ibbl Job Circular 2018 into an Image file. Because Job seekers can Read easily. Thay Also free Download Smoothly. See Below The Original Job Circular 2018 JPEG file. To Recieve Next update Islami Bank Bangladesh Limited ibbl Job Circular 2018, Like Our Facebook Page ChakrirKhobor and National university. Thank you For Read My Job Circular 2018 Blog.